Jennifer Silk (left) and Erika Forbes have been named fellows of the Association for Psychological Science. The national honor recognizes “sustained outstanding contributions to the advancement of psychological science.” Their election to fellow status places them among the country’s most lauded researchers and teachers with over a decade of postdoctoral contributions. 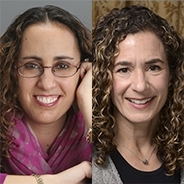 Silk, an associate professor of psychology, and Forbes, a professor of psychiatry, both study the development of depression and anxiety in adolescents. Silk’s work looks at how teens’ emotional reactivity and regulation change during this crucial developmental period, and how these changes look different for people who develop anxiety and depression. Forbes studies reward circuits in the brain for clues as to how mood problems and substance abuse develop. “The prevention and treatment of anxiety and depressive disorders in teens is a timely issue, and Pitt has a longstanding history of breaking ground in this area,” Silk said. “Being named an APS fellow is a great honor, and it feels even more valuable to be named at the same time as a distinguished colleague and longtime collaborator,” Forbes added.